Auto-Dialers are used by many Debt Collection Agencies to increase the productivity of Debt Collection Agents. These devices send simultaneous messages to a lot of Debtors at the same time. Most people easily recognize these robotic messages and don’t even bother to pick up the phone, a few, however, want to resolve the debt and will answer. Since the Auto-Dialer sends out many messages at the same time, the Agency can employ a small number of Collectors to handle the calls. If not enough debtors are picking up the phone, the rate of message sent can often be increased to keep the Collectors busy. For the Collection Agency this is a good thing. 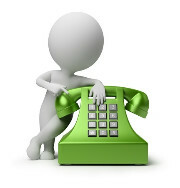 Collectors don’t have to make a lot of calls to reach an interested debtor. the Auto-Dialer does it for them. The Collector can get as many payments in an hour as a traditional Collector does all day. As you can imagine, that does a lot of good for the Agency, but what does it do for you? You don’t use a Collection Agency so they can make money, you use one so YOU can make money. Do Auto-Dialers make you more money? Debt Collection messages are clearly very negative. What do you do if you hear a less negative Auto-Dialer message from a questionable charity? My guess you would erase it later or hang up on it. Now, how do you think a debtor, often with other Agencies also calling, will react? Obviously, human calls should be more effective, even if they are much more expensive. A person can only call about 20 or 25 people in an hour while an Auto-Dialer can make thousands of calls almost instantly. Auto-Dialer companies make a big point of the savings. They focus on cost savings. They never mention the loss of productivity because that often isn’t the Collection Agencies major concern. With an Auto-Dialer, the Agency can offer lower rates and, frankly, that is all some prospects notice. What the sales pitch always ignores is the related decrease in the amount collected. Is it worth saving 7 percent to lose 30 percent of Debt Collection returns? Nobody tells the prospect his returns will be dramatically lower. Just keep your focus on the lower price. You may never even notice how much money you are losing.